This study showed pattern spread of 25% for similar fragmentation to reduce drilling cost. Also, fly rock and noise control opened mine reserves previously closed due to community concerns. 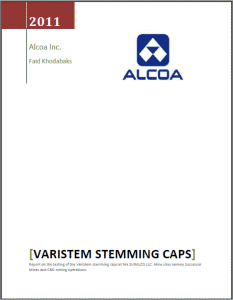 This test is designed to test the effectiveness of the Varistem stemming caps. The gains claimed by the Varistem Corporation are an increase in fragmentation, a reduction of flyrock hazard and a reduction of noise and vibration. The improvement on fragmentation will benefit both mining sites as fragmentation influences ROM truck fill factors and also reduce crushing and milling costs. But the reductions in flyrock, noise and vibration are most important for the CBO mining site as the bauxite mines move ever closer to the community areas, hereby disturbing the inhabitant's daily routines. That the 25% increase in confinement can lead to a pattern expansion of 25%, resulting in the same fragmentation. Or this fact can be rewritten leading to another fact namely that with the same pattern 25% less explosives is needed to achieve the same results in fragmentation. Which configuration of products delivers the best economic performance? What are the possible financial gains in implementing the Varistem caps? Is it possible that implementation of these caps open up new reserves closer to the community (applicable for CBO ops.)? It was concluded that even with a pattern expansion of 1 meter extra burden, the fragmentation provided was more than sufficient, meaning a pattern expansion is justified using the Varistems which will result in more minable ore with the same amount of meters drilled. The biggest gain that can be achieved with the Varistem is the gains in reserve where previously blasting of the ore was deemed impossible due to community issues.